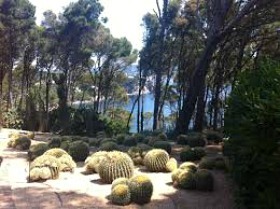 The Costa Brava is blessed with having two of the most beautiful botanical gardens in all the Mediterranean. 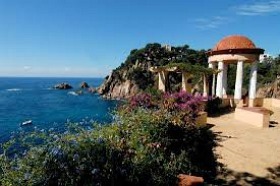 Both of the botanical gardens are perched on cliff tops with breath taking views of the sea and the Costa Brava coastline. 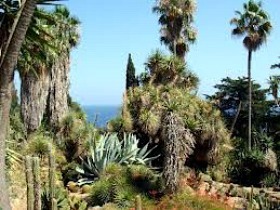 The 17 hectare Cap Roig Botanical Garden is in Calella de Palafrugell. 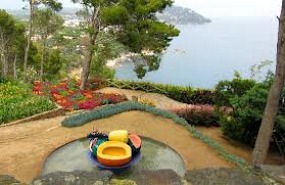 From 1927 to 1969 Cap Roig was a private home and garden. These days it contains over 1,000 botanical species from all over the world. The garden is terraced all the way from the house (castle) down to the beach, offering many tantalising views of the sea, but the best view is from Mirador de la Lady. Cap Roig is also a well known arts centre - hosting sculptures by international artists and the world famous Cap Roig Music Festival. The website for the gardens (www.caproig.cat) no longer seems to be working, but for more details on how to get to the gardens and for information on Cap Roig Music festival click here. The 4 hectare Marimurtra Botanical Garden is in Blanes, right at the top of a very steep hill, above the port at the north end of Blanes beach (unless you are fit I wouldn't attempt the walk up from the town...catch the bus instead. You can always walk back down). As you might have guessed, because the gardens are on top of a hill, the views are breathtaking! Marimurtra is one of the oldest botanical gardens in Europe, established in the early 20th Century by a German botanist. It contains plants from all over the world, divided into 3 main sections (tropical, temperate and Mediterranean).